Pictured (L-R): Sony Music Nashville’s Allen Brown and Jaime Marconette; CAA’s Kylen Sharpe; Sony Music Nashville’s Chairman/CEO Randy Goodman; Cam; Sony Music Nashville’s Josh Easler, Jen Way, John Zarling; Cam’s manager Lindsay Marias; and, CAA’s Rod Essig. 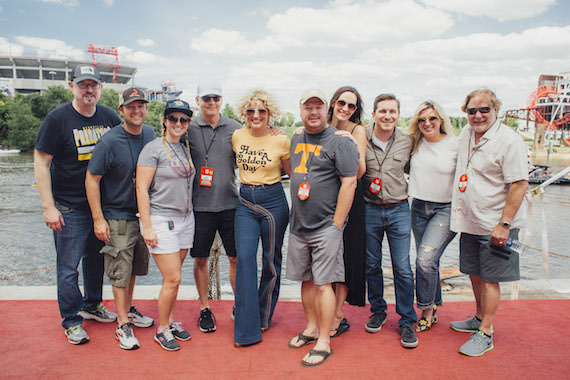 The most flawless weather in CMA Fest memory continued on Saturday (June 10). Fans were treated to plenty of warmth, to be sure. But Nashville’s oppressive summer humidity was absent, and a breeze blew all day. No wonder there was a veritable armada of boats floating behind the Riverfront Stage throughout the afternoon. They were the backdrop for the sounds of some of the finest up-and-coming talents in country music. The Riverfront lineup on Saturday included Brett Young, High Valley, Drake White, Cam and William Michael Morgan. Hot stuff. Meanwhile, a solid lineup of talented vets populated the Budweiser Forever Country Park off Lower Broadway – John Berry, Andy Griggs, Mila Mason and Terry McBride among them. Too hot for you outside? In the Xfinity Fan Fair X exhibit hall of the Music City Convention Center you could sit in air conditioning and take in both newcomers and established artists. In the former category were Levi Hummon, Walker Hayes, Luke Combs and Michael Tyler. Among the latter were Rex Allen Jr., Barbara Fairchild, Even Stevens and Jim Lauderdale. 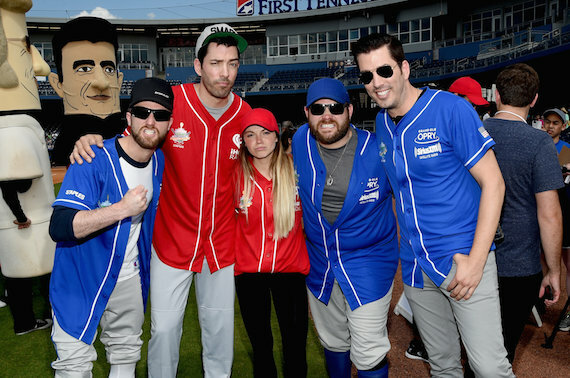 Over at First Tennessee Park, the attraction was the 27th annual City of Hope Celebrity Softball Game. Vince Neil of Mötley Crüe surprised fans by throwing the first pitch. 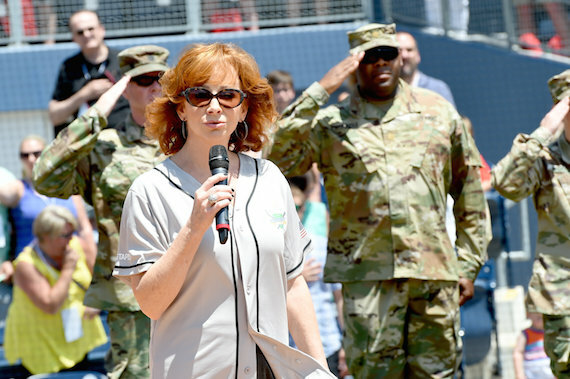 Reba McEntire sang the National Anthem, followed by a performance of “Take Me Out to the Ballgame” by Sara Evans. Team Captain for iHeart Media was Bobby Bones, and Team Captain for Sirius XM/Grand Ole Opry was Bill Cody. The Bones team won, 9-6, but who’s counting when it’s all for such a good cause? Artists participating included Billy Ray Cyrus, Craig Morgan, Kellie Pickler, Jessie James Decker and her hubbie, NFL player Eric Decker. Also Lauren Alaina, plus Lunchbox, Eddie & Ray of the Bones radio show, Drew Scott & Jonathan Scott (The Property Brothers), Aaron Watson, Trent Harmon, The Swon Brothers, Danielle Bradbury, Maggie Rose and Miss Tennessee Allee-Sutton Hethcoat. The play-by-play was called by Lee Greenwood, Jeannie Seely, Tim Rushlow and Gator Harrison. Went home. Put my feet up. Rested. Changed clothes. Headed back out for the Saturday evening shoe at Nissan Stadium. Bobcat Company, the Knoxville Central High School choral group, sang The National Anthem. As the sun began to set, fans were taking their seats while the great John Anderson took the stage. He was in splendid voice as he fired off hits, blam-blam-blam. “Black Sheep,” “Straight Tequila Night,” “Money in the Bank,” “Swingin,’” “Seminole Wind” one right after another. What a stylist that guy remains. 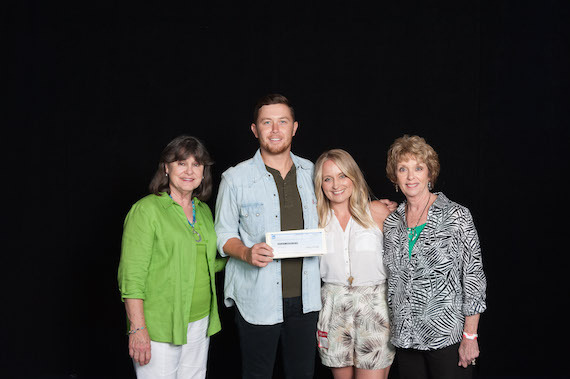 At this year’s Scotty McCreery Fan Club Party, a core group of fans surprised McCreery by donating $2,100 in his honor to the CMA Foundation to support music education. Pictured (L-R): McCreery fan Sharon Jules, Scotty McCreery, CMA Foundation’s Tiffany Kerns, and McCreery fan Betty Holt. The stage presence of Maren Morris has improved dramatically since she made her debut at the fest last year. Sporting short locks, she was snarky on “Rich,” touching on “I Could Use a Love Song” and soaring on “My Church.” A good job, all around. Each night of the fest has featured a surprise guest. Saturday’s was Old Dominion, who made a brief but highly musical appearance. Lady Antebellum followed, complete with horns purloined from Justin Timberlake in Memphis. Thomas Rhett gave the crowd “Die a Happy Man” and brought out Maren Morris to sing “Craving You” with him. But the night belonged to the showmanship and the mega hits of Florida Georgia Line as a beaming full moon shone over the stadium. Major Megan Barry showed up to bask in it all. Also working the room were Christy Walker Watkins, David & Susana Ross, Izzie Ross, Brandi Sims, Laura Crawford, Bret Wolcott & Lydia Lenker, Steve Popovich Jr., Terry Calonge, Horton Frank and the 615 band drummer Louis Winfield. 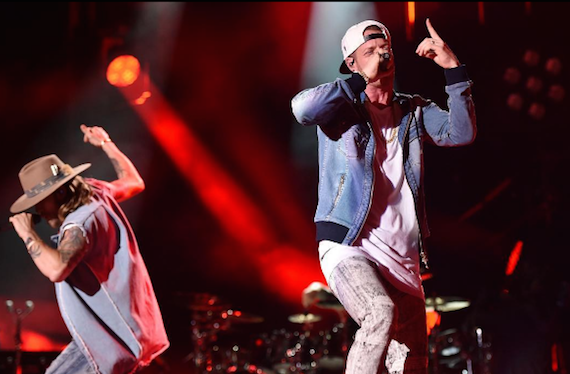 The CMA Fest alternative to the big Nissan stadium concert was at Ascend Amphitheater on Saturday evening. That venue’s Cracker Barrel Country Roads Stage presented a Warner Bros. Records bill starring Dan + Shay, Hunter Hayes, High Valley, RaeLynn, Cale Dodds, Ryan Kinder and Bailey Bryan.